What is the Thunderbird Hunting Club (THC)? Two words best summarize our hunting—outstanding and consistent. Through droughts, floods, mild weather, it doesn’t matter, we shoot birds, day after day, month after month, year after year. Last season (2017-2018) the club shot 6,093 birds for an average of 20.8 birds / 4-man blind / day. During the first duck split we averaged 5.4 birds / gun / day and for the second duck split averaged 5.3 birds / gun / day. 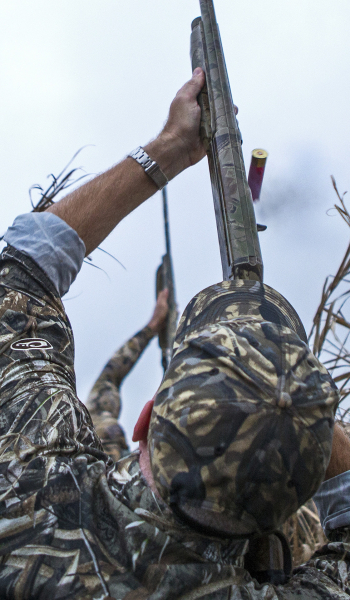 For the entire season 68% of our groups shot full limits on ducks, all on an unguided basis. What do you attribute to the success of THC? Keys include good organization and communication, working extremely hard year-round, making great habitat, controlling hunting pressure, and our great members who work hand in hand in making the club what it is. Last season the Mid-winter Waterfowl Survey conducted by Texas Parks & Wildlife Department found ducks were down 76% from last season along the Gulf Coast and the lowest since 1998, yet Thunderbird had its best season ever! Proof positive that we attract the waterfowl like no one else and provide the absolute best hunting around. Do you limit how many members are in the club? Very much so, as stated Thunderbird is about quality. Too many members results in calamity, we hear about it from others every single season. We think the size of the club is perfect with enough land to move members and their guests around on birds, yet at the same time small enough to learn in one season and not be impersonal. Because we have an abundance of “good spots” it is not competitive among the membership, old members help new members learn the ropes, something we are very proud of. How many acres does the club have? Actually the question should be, “How many acres of quality habitat will I be able to hunt?” It is not the quantity of land, rather it is the quality of habitat per the hunting pressure that really matters. Great habitat and limited guns is the key to having great hunts, it is what we do best. 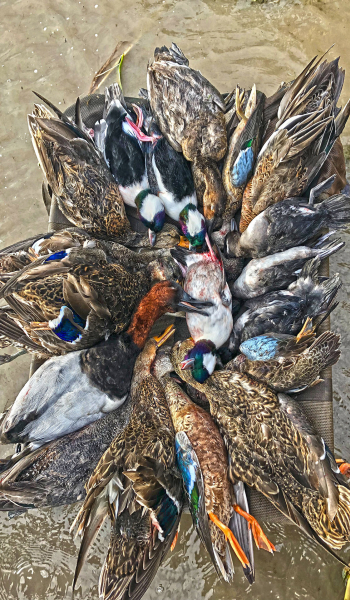 Why do your members shoot so many birds? Three truths; making and maintaining habitat, controlling and enforcing hunting pressure, and communication with the membership, easy to say, difficult to produce. 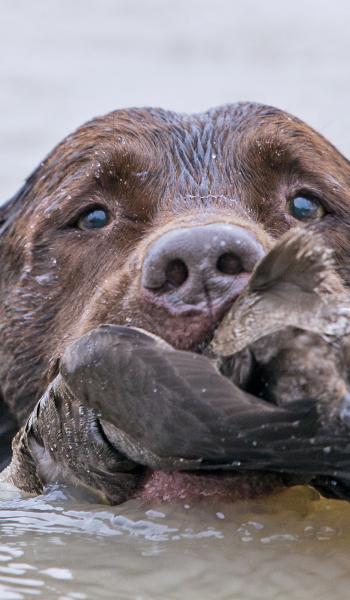 A good friend of ours in Ducks Unlimited once said, “Making good waterfowl hunting is not Rocket Science, it is much harder!” Any successful business crunches numbers rather than rely on gut-instincts. At Thunderbird we fanatical about the stats, they tell us what we are doing right, where we need to improve. We know exactly how many hunters we average on any given day, how cost effective a property in terms of waterfowl harvested, how many guests hunt at the club, what pond produces the most limits of ducks, the costs on each duck shot on a given pond, etc. We have been keeping numbers for over a decade on the club. Statistics helps us not only manage the properties / habitat more efficiently, it also helps us regulate the gunning pressure to assure quality hunting for the membership. On a busy Saturday we may hunt 1/3 of our ponds (only one group of 3-4-guns / pond, not 6-8 guns per blind or multiple groups hunting on same pond), leaving thousands of waterfowl and numerous wetlands undisturbed. How do you make good habitat? Making great habitat for the waterfowl to feed and roost in is a year-round endeavor at Thunderbird; discing, shredding, planting of food, aerial spraying, controlling water clarity for aquatic plant growth, installing intermediate levees and water control structures for proper water levels are a few of things we do. “A POND FILLED WITH WATER IS NOT A DUCK POND.” We have seen “folks” take over great leases, only to have them fail as “duck ponds” instantly the first year. To be successful you must know how to farm food for waterfowl. On staff are two degreed experts in the cultivation of waterfowl foodstuffs. It is very expensive to manage properly and takes years of experience to get it right. Read recent article in website by Todd Steele under Media / Steele Articles / Important Waterfowl Foods Along The Gulf Coast. All of our properties have deep-water wells that allow us to pump water when the habitat needs it. This is extremely important, as controlling water levels are critical to attracting and keeping waterfowl. In addition you must have the ability to pump water in the fall and winter to keep aquatics alive, once they dry out the food source is gone for the season! How do I know where the best waterfowl hunting is occurring? If you are not hunting were the waterfowl were the day before, the odds are great you will not have a very good hunt. We put a great deal of effort and time in getting the members on birds. During duck season the club has bi-weekly Scouting Reports on where we found birds, weekly Newsletters, flash-memos, Friday evening lodge discussions on the birds and members have direct access to all of our managers. Countless man-hours are spent throughout the season to help each and every member hunt the exact “X” for shooting loads of birds on each and every hunt! Our results speak for themselves. In addition, starting in September and going into January we post our weekly Migration Report (refer to seperate section for examples), this gives you up to date information on migrations of birds, both in the Central Flyway and along the Texas Gulf Coast, gathered from dozens of sources. What else can I do at the Thunderbird? Included in your membership; dove hunting, goose/crane hunting, snipe / rail hunting, and saltwater fishing. Other activities include; kayaking, crabbing, gathering oysters, clay-bird shooting, retriever training, lodge cookouts, limited hog hunting, and group get-togethers at the lodge. Is the lodge included in my membership? Yes, your membership entitles you to use of the lodge year-round, per calendar year starting March 1. Lodge is fully furnished with all the comforts of home. For an additional fee THC has limited RV Trailer Pads and Private Cabins all with full utilities. When are the dues do? 50% deposit is due upon joining. 50% of the remainder of the dues is due August 1.